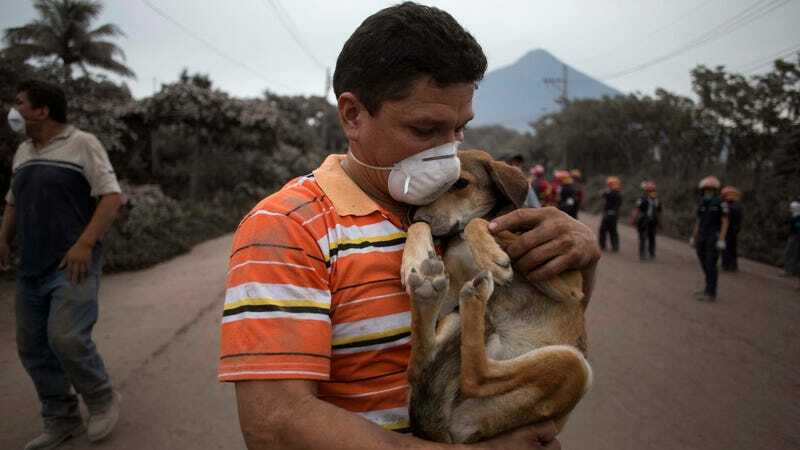 A resident cradles his dog after rescuing him in the wake of Fuego’s eruption. On Sunday, a major volcanic eruption rocked Guatemala. At least 25 are dead after Volcan de Fuego, one of the most active volcanoes in Central America, sent pyroclastic flows of super heated gas, ash and debris rumbling down its flank. An estimated 1.7 million people have been impacted by the eruption, which caused ash to fall in Guatemala City 20 miles to the northeast. 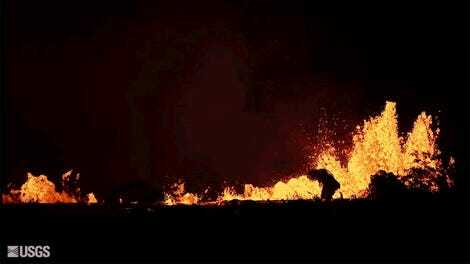 Despite the fact that Volcan de Fuego is extremely active, an eruption of this magnitude is fairly uncommon. The Smithsonian maintains a global volcano database that lists 79 eruptions at Fuego dating back to 1580 BCE. The largest eruption in recent history was in October 1974, when pyroclastic flows wiped out crops in the area. Smaller eruptions have been the norm for the past couple of years. Just a few weeks ago, a moderately sized volcanic mudflow known as a lahar rolled down its western flank and the volcano belched a few plumes of ash. It was also fairly active in 2017 with numerous eruptions, including some ethereal ones with lava flowing down its flanks at night. None of those compare to Sunday’s eruption, though, which was documented in terrifying videos of people trying to outrun the pyroclastic flow like a summer disaster movie. The eruption began like numerous other eruptions over the past couple years, according to Rudiger Escobar Wolf, a volcanologist at Michigan Technological University. Stratovolcanoes like Fuego tend to be more prone to energetic eruptions than their shield volcano cousins like Kilauea, which produce more oozy lava. That’s because they generally tap more silica-rich magma that traps more gas. There are of course exceptions to this rule, but rumblings and small plumes of ash are fairly common for Fuego. “But this eruption then escalated to something much more intense, reaching [around] 15 kilometers above sea level, which is uncommon, so at that point it started to become clearer that this was a different level of eruption,” he told Earther in an email. That towering ash cloud quickly fell back to Earth and roared down the volcano’s flanks. Pyroclastic flows generally move at speeds faster than 50 mph according to the U.S. Geological Survey, and some can move much faster. Though the eruption started hours before the pyroclastic flow, at first it wasn’t necessarily cause for alarm because of how often Fuego erupts. Escobar Wolf, who hails from Guatemala, said that while he had seen some warnings, there were no explicit orders to evacuate ahead of time, which is why the magnitude of the eruption may have caught some people living in the volcano’s shadow off guard. In the wake of the eruption, more than 3,100 people have been evacuated from the area. While the eruption has ended, it’s possible there could be more in the coming days and weeks, according to the Guatemala National Institute of Seismology, Vulcanology, Meteorology and Hydrology. Authorities are continuing with search and rescue efforts, though surviving a pyroclastic flow is highly improbable with temperatures that can reach up to 700 degrees Celsius (1,300 degrees Fahrenheit).